People also share that, as they age, they often become lonely, isolated, no longer enjoy hobbies or socializing, and lose physical strength. They tend to keep this to themselves as they do not want to burden others, or face moving to a “home.” Many folks accept this as a natural part of aging. They simply expect and accept that as they age, they will decline, and no longer do the things they love to do. Here in Northwest Pennsylvania, it is not uncommon to get the “winter blues.” It becomes harder to keep those goals to stay active, making it easier to settle in and become a couch potato. So how can you stay independent, active, and healthy longer? Firstly, considering a move to a community like Wesbury, can actually mean GAINING independence. How? Because they free you from the burdens of maintaining your home as well as remove the need for you to depend on friends or family. People who move to Wesbury thrive. They regain strength, balance and endurance simply by walking to the dining room even if they don’t bother with daily exercise class. They eat better because they don’t have to cook for one person. They reconnect with old interests like socializing, painting, games, fishing, concerts, and movies. They enjoy going to church or bible study right on site. They don’t have to miss out anymore simply because they don’t drive or don’t feel up to going out. Exercise throughout the house. Walk through every room, up and down the stairs, get up and down from your chair, or do low impact chair exercises. Consider a DVD exercise program. Take a walk outside, walk the dog, get the mail, or walk at a mall, or park. Be sure to dress warmly and wear good shoes, as it is important to be safe when going out. Stretch, and make sure you get up and move at least once per hour. Break up long periods of sedentary time by changing positions. This can motivate you to get up and get moving around. Consider physical therapy. If you have significant loss of strength or endurance, you can talk to your doctor about having in-home therapy. Therapists can come to you, evaluate your home for safety, and help you develop an exercise routine. 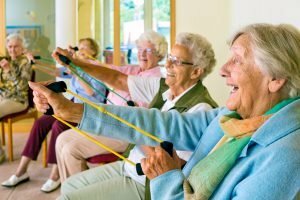 Area Senior Centers also offer exercise classes and all kinds of social engagements. Check out the monthly Active Aging Echo newsletter for offerings at each of their locations. Join Body Recall classes offered three days per week at Wesbury. Remember, it is just as important to keep the mind sharp as it is the body, especially in winter when we tend to have fewer engagements. Find something you enjoy doing, such as crossword puzzles, playing computer games, or learning to do something new like painting or playing an instrument. Try to commit to doing it for at least an hour each day. Stimulate your mind and improve your memory, your mood, and your health. Wherever you are in your life, stay as active as you can, for as long as you can, in whatever way works for you! It’s important to exercise your body, mind and spirit at all stages of life. If you need a little motivation, come to Wesbury for the winter, where exercises for the body, mind, and spirit are included daily. Enjoy your stay at Wesbury’s Cribbs Residential Center. Just bring your suitcase; we will take care of the rest! Please call Melissa at (814) 332-9009 for more information or submit a request for information here.